The first two drinks in this series were alcohol mixed drinks at bars, but I’ve decided every couple of weeks or so to go somewhere for a non-alcohol drink since I’m sure there’s a portion of the MBIP audience that doesn’t drink alcohol and this way we can spotlight a drink that all of us can enjoy. 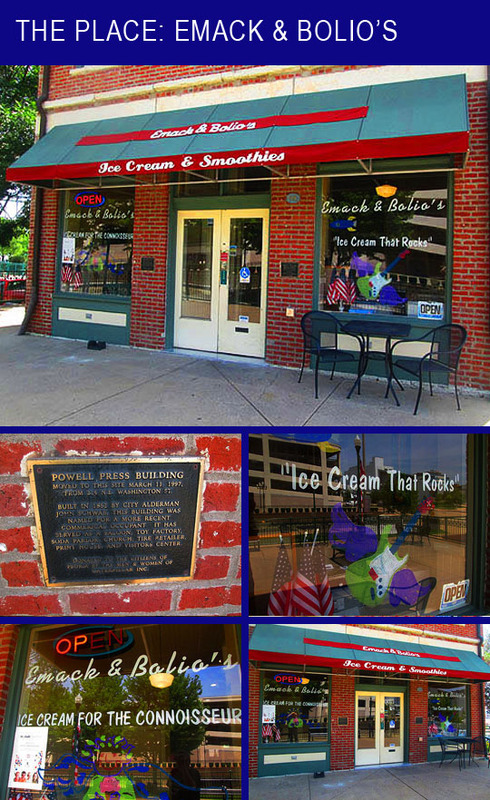 With that in mind, I thought I’d head down to Peoria’s Riverfront and visit my good friend of five decades and this blog’s Spiritual Guru and co-owner of Emack & Bolio’s, Tim Hennessey to see what sort of ice cream drink he suggests for The MBIP Drink of the Week! Emack & Bolio’s is the sweet spot on Peoria’s Riverfront. It’s owned by Tim Hennessey and Jim Maxwell, two of the nicest guys in Peoria! Emack’s is located in the hisotric Powell Press Building which is the oldest commercial structure on the riverfront. Okay, let’s go in and see what’s happening inside where we can hide from this hideous sunshine beaming down in such a cruel manner. There’s Tim behind the counter whipping up an ice cream treat for a customer. This is a spacious location with a table in the front corner and a full-size dining room in the back of the building. The best thing in here is the Linda Ronstadt art by my brother, Jim. Very cool of Tim and Jim to have that on the wall! A Root Beer Float! They have all kinds of drinks, shakes and smoothies at Emack’s, but we decided to go with this classic and refreshing summertime drink. The Emack & Bolio Root Beer Float! Tim told me that they also include the bottle which has a few swigs of root beer still at the bottom. It looks delicious and we have a special guest in the ice cream parlor to sample it with me! The special guest is my friend and yearly MBIP tattoo photographer, Matt Buedel. We posed for a picture with the two of us drinking out of the glass with two straws like dewy-eyed teenagers in love, but Tim took the photo and this is all we got! Either the MBIP camera malfunctioned or Tim didn't press down hard enough, but no big deal, I should've double-checked them and didn't. You'll just have to picture Matt and I looking something like this. Well, at least these turned out! The Emack Root Beer Float is a summertime treat that tastes even better when you sip it on Peoria’s Riverfront at Emack & Bolio’s! Thanks to Tim for a delicious and refreshing Root Beer Float! And thanks to Matt for joining me and hanging out! We’ll see you all tomorrow! Related Posts: The MBIP Drink of the Week @ Mike’s Tavern and Tannins & Hops.